Yesterday was the day when The Official Launch of the next gen browser by Mozilla came out in the open, after the much hyped FireFox Download Day promotions. The much hyped browser made its debut with a bang but not after the initial slip. The kind of amazing hype Mozilla had created about FireFox it was expected that the download servers would be fully loaded with requests and traffic, and some websites even urged to grab the copies as soon as possible so as to show real traffic and fan following towards FireFox and so it happened. Critics gave rave reviews and so the biggest hype about a product in recent time was created. But here came the slip up. 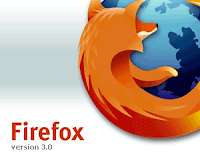 FireFox was to launch at around 10:30 PM IST but at that time Mozilla's servers were Bogged down totally. Either the site was not opening up and even if it displayed the page, FireFox 2 was shown as available for download, and it was not before 2 hours of regular requests that I was able to lay my hands on FireFox 3. The web page opened at around 12:30 AM, 18 June 2008 IST. But that was what shows the dedication of fans towards FireFox. Anyways first of the browser wars have started, but initial inspection does show Opera 9.5 is better than FireFox 3 taking out the extra plug ins feature in FireFox.